A large membership for the era. Members of the Bridge City Volunteer Fire Company No.1 are posed in front of their first one bay fire station located on 10th St in Bridge City, LA. 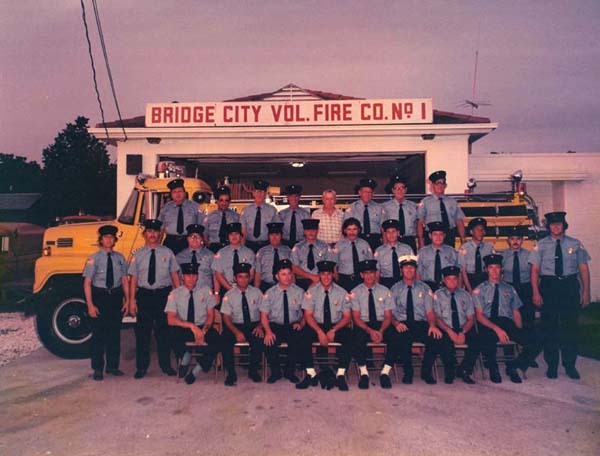 The Bridge City Volunteer Fire Company No.1 was founded in 1949 by local residents and business owners. The community was the backbone during the beginning of the fire department. Several residents and businesses installed a fire phone in their homes and at their business. Mr Alance Hartman was the first fire chief for the department and he remained active, serving on the fire company�s board of directors until his death in 2005. The following fire chief, Ferril St. Pierre, had the good foresight to visualize community growth and the fire department�s need for growth along with the community. After a plot of land was secured at 2220 Bridge City Ave and the construction of the new station was completed, the first fire station on 10th St was closed. The 2220 Bridge City Ave location is the present day location of the existing department's only fire station. Chief St. Pierre served as fire chief for 28 years until his death in 1999. In 1999 chief Gary Bourgeois served as fire chief until he left office on a medical leave in 2001 and at that time the present fire chief Gary Girard took over the position. Chief Girard is very pro active in community relations and fire prevention. The chief and board of directors formed the Support Group, comprised of ladies in the community that assist with rehab at incidents when needed. The Support Group is also instrumental in fundraising efforts and purchases needed equipment for the department with the proceeds. Present day activities finds the Bridge City Volunteer Fire Company No.1 involved with the community, even proclaiming it on the firefighter�s shirts, �Community Pride�. During Hurricane Katrina both paid and volunteer firefighters served the community throughout the whole event. Chief Girard is proud of the members of the fire department, stating �he loves every one of them and will stand with them through anything. I trust them with my life, hands down�. 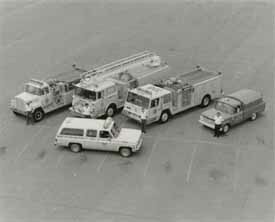 An assortment of equipment of the Bride City VFC in the early years. The sloped cab is that of a Pemfab fire truck. The department worked with neighboring fire departments in order to learn how to safely fight fires. 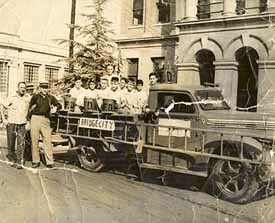 The first fire truck (it was red) for the department was donated and is seen after acceptance of the equipment in Gretna, LA where the truck was delivered by the parish. Money for equipment today is obtained from a millage allotments from Jefferson Parish and a water surcharge on each homeowner�s water bill. The Bridge City Volunteer Fire Company No.1 is part of the 7th District that is comprised of Avondale, Bridge City, Herbert Wallace, Live Oak Manor and Nine Mile Point fire departments. 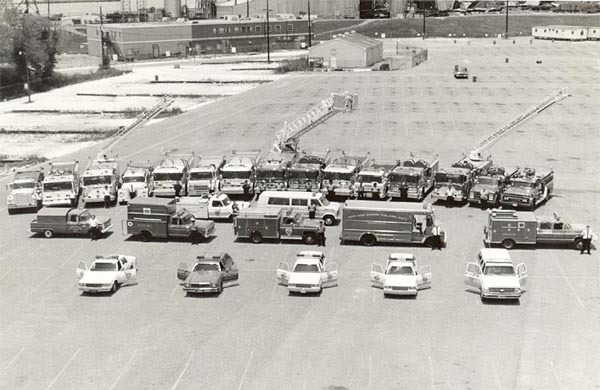 This early years picture shows all of the equipment of the 7th District that is ready to serve their communities and people of the 7th District. All of the departments provide mutual aid with other district departments in the event of a major incident such as a fire or major accident. The equipment is posted on the parking lot of Northrop Grumman Ship Systems, formerly Avondale Shipyards. 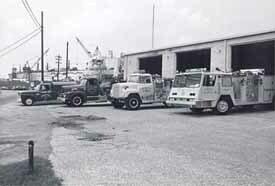 Another view of some of the early days at the current fire station located at 2220 Bridge City Ave. Note the gravel and unfinished blacktop. Avondale Shipyard is in the background. The first brick veneer was of a stylish white (blond) color, popular in the 1960's era. Today the station is constructed with tan brick. The station was heavily damaged during Hurricane Katrina, suffering from severe roof damage and brick veneer collapse.